The classic in large kitchens and the catering industry. A clever development from BLANCO. For the healthy way of cooking. Maximum use in many areas. Masters every curve. Without spilling! 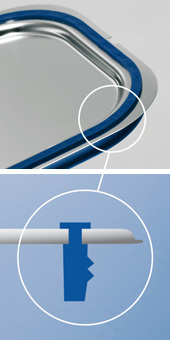 For the correct storage, drying, transport and dispensing of Gastronorm lids with form-fitting seal. 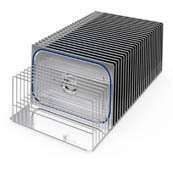 Through its special geometry, it fits perfectly on 10 x 6 serving trolley shelves with dimensions of 1000 x 600 mm. 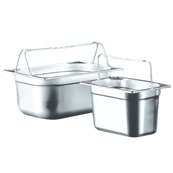 It can hold up to 30 Gastronorm lids GN 1/1 or a large variety of smaller lids. Flat lid for complete filling. 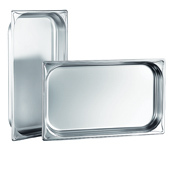 Perfect with Cook&Chill: This exceptionally flat lid without a handle allows for optimum content capacity of the GN containers. Open wide and the heat stays inside. Over 50 years of experience in the manufacture of GN containers vouch for BLANCO's excellent quality and a long service life. 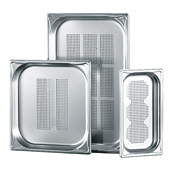 Easy stacking and destacking thanks to the stacking collar and precise corner finishing. comfort from a container depth of just 40 mm. The GN containers with U-handle can easily be carried with one hand. Since the handles don't heat up, you don't have to worry about getting burned. Stackable? – You bet! Even when filled! The innovative sealing lid made of stainless steel with a silicone seal for slosh-proof transport of your food. BLANCO have the right GN accessories for any challenge. The size, depth, volume, standard and date of manufacture can be found on the back.